Hello everyone and welcome back to SixPrizes! Many of you likely paid attention to the Latin American International Championships in Brazil, which means you got to hear all about the thrilling Zoroark-GX Control deck that my group played at the event. The deck definitely has a different style of play in comparison to most of the competing decks, which means a lot of different things. For some, this intrigues them because it takes a good grasp on the deck to pilot it well and close out games. Others look at the deck and simply fall asleep. No matter what your opinion was of the deck before this article, I hope to provide some insight to why I am such a big fan of the deck. Additionally, I will talk about how the deck fairs moving forward. Without further adieu, lets hop into things with a look at my decklist from the event. This card is a crucial piece to the deck. The deck just didn’t feel complete until Sableye made its way into the list. It is definitely more viable in certain matchups, but it has the potential to steal pretty much any game. 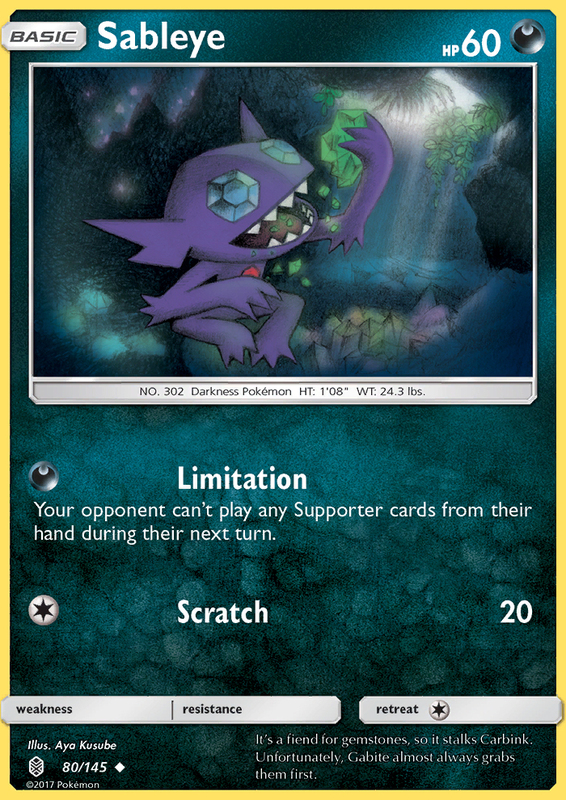 Sableye is mainly used as a way of preventing the opponent from ever attacking again because you can bring up a bench sitter with Guzma or Counter Catcher, and then lock it active with Limitation. This strategy is especially strong against Magcargo and Malamar. Obviously, Oranguru is the whole reason this deck works. Resource Management allows you to outlast the opponent and leave them unable to continue playing the game. While you should focus on running the opponent out of energy, this doesn’t mean that you should be putting three Crushing Hammers in every time. The decisions you make when using Resource Management are extremely important, and messing even one of them up can result in a loss. As for why the deck plays two copies, that should be pretty clear by now. It is just that important! You want to find Oranguru early so that you can start shuffling resources back in right away. Additionally, you don’t want to have any problems continuing to Resource Management after an Oranguru gets knocked out. With two in the list, this will be a lot easier for a couple of reasons. For starters, you will be able to have both of them in play, which eliminates the need for Switch or Guzma. Additionally, you won’t be as reliant on finding your one copy of Rescue Stretcher. Definitely not useful in every matchup. In fact, it is borderline useless in a fair share of matchups. The trade off though, is that it is key to keeping opposing threats under wraps in the matchups it is useful in, such as Blacephalon-GX or Buzzwole/Lycanroc-GX. You simply Cold Crush-GX, which will usually not result in your Articuno being knockedout, and then you can follow up next turn with an Acerola. Incredibly strong against Oranguru SUM and Marshadow-GX. The decks that play these cards are pretty reliant on them, so an early Alolan Muk can carry you to a win by itself. In conjunction with all of the disruption at our disposal, it becomes very difficult for effected decks to operate in a normal fashion. These are the energy disruption cards that the deck plays, which are main way that this deck wins games. Without these, the deck would literally be doing nothing and have no real gameplan whatsoever. This is why the counts are so thick, two Plumeria and two Team Skull Grunt might seem like a lot, but they are just neccessary in the deck. Four Crushing Hammer is the standard count whenever it finds its way into a deck, and that is no different here. 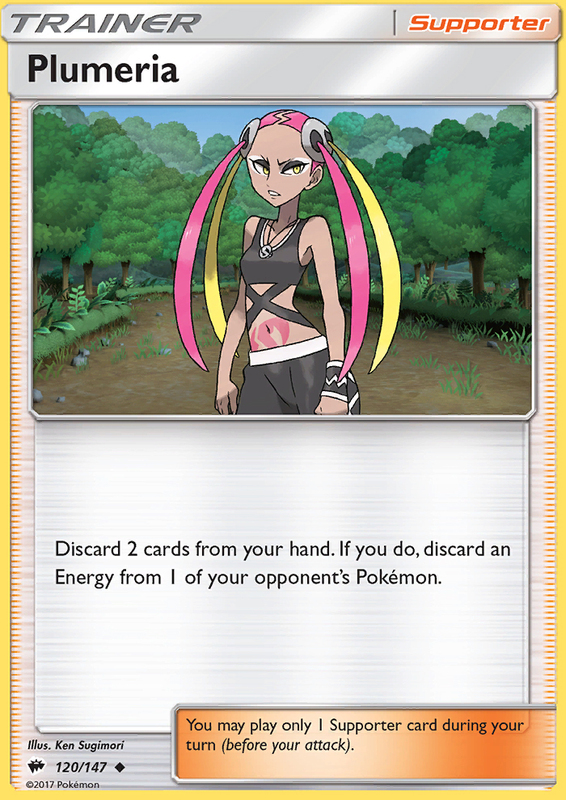 Plumeria is a guarantee that an opposing energy attachment gets removed from the board, which is pretty lethal when it can be used every single turn. Team Skull Grunt, while operating differently, is still a tool we use to manage the opponent’s energy. On a turn where the opponent does not attach an energy, or you flip a juicy heads on Crushing Hammer, Team Skull Grunt is usually the go to supporter for the turn. Crushing Hammer is a great way of messing with the opponent’s energy without playing a supporter. You won’t get heads on all of them, but you won’t need to. The occasional heads on Crushing Hammer brings a lot of value to the table, allowing you to play an actual supporter for you turn. Crushing Hammers also allow you to potentially remove multiple energy in a turn, helping to make up for the first couple turns of the game when you were focused on getting setup. At first we had two Guzma and one Counter Catcher, but it just seemed more and more backwards as we played games. The deck is pretty much always behind on prizes, and it is very easy for the opponent to take a knockout early in the game. This was enough reasoning for us to switch the counts, opting for the double Counter Catcher that was in the final list. Guzma still felt important in a lot of situations, such as when you need a switch effect, so we didn’t want to remove it from the deck completely. I have talked about a ton of different important techs and matchup specific cards, and this is what ties all of that together. Since this deck is packed with techs and has some situational cards, Gladion makes sure that you don’t lose games to your prize cards. Sure, you can prize Gladion and a few key cards and lose that way, but think of Gladion as a safety net. Additionally, Gladion can be to used in the early game to grab something like a Double Colorless Energy to get the game moving. You do have Oranguru to help recover your supporter cards, but Pal Pad can be used in a variety of ways. For starters, shuffling in Pal Pad with Resource Management, as opposed to two supporter cards, allows you to shuffle in an extra card essentially. The Pal Pad is also very nice in situations where you aren’t using Resource Management every turn, or if you needed to shuffle in three cards that are not supporters. Having both Max Potion and Acerola in the deck is something that my group mulled over quite a bit, and ultimately decided was worth the space. Against decks like Decidueye and Tapu Koko, the extra healing can really help you deny the opponent prize cards. After each use, you simply shuffle them in and repeat the process. Having Max Potion in the deck is nice for some of the same reasons as Crushing Hammer, as odd as that may sound. By using Max Potion on a turn, instead of Acerola, you leave yourself with the option to play a supporter card for the turn. These are okay across the board, denying the opponent the use of tools is never a bad thing, but they are especially strong against Malamar and Decidueye. Against Malamar, they have no way of removing it once it is in play. Denying the opponent the use of Escape Board is fantastic, especially when trying to lock a Malamar active. At the end of the game, these Lysandre labs are the key to locking Malamar out of the game. As for Decidueye, Lysandre Labs is definitely very strong. It makes the opponent find a Field Blower, which is run as a singleton copy in most lists. With Lysandre Labs in play, the opponent’s Zoroark can only hit for 120, as opposed to 150, which makes it a lot harder for them to get in range with Feather Arrows. This might seem like an odd energy lineup, and honestly, it is. I don’t know if I have ever seen a Zoroark deck that chose to only include three Double Colorless Energy. While we didn’t really want to remove a Double Colorless Energy from the deck, we really wanted to include a second Rainbow Energy. With Articuno-GX and Sableye in the deck, it just made a lot of sense. Additionally, Oranguru can attack with either energy card, so there isn’t really a difference in that area. Like I said at the start of the article, this deck operates completely differently from the rest of the format. While other decks attempt to gain board control and win the prize race in whatever fashion they choose, this deck does not aim to take prizes. 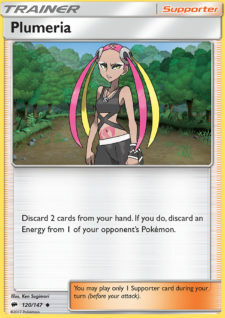 This deck aims to run the opponent out of resources, mainly energy, and then deck the opponent out or slowly KO all of their Pokémon with Riotous Beating. In the current meta, most decks are unable to keep up with this strategy. A lot of decks are running very low energy counts, and simply don’t have the resources to draw six prize cards against a deck with so much harassment. When we take a look at the decks played in Brazil, a lot of the popular ones had extremely unfavorable matchups against control Zoroark, while some of the less popular ones gave it trouble. That being said, it was a strong metacall that ended up paying off, so what does this mean for the deck’s future? The current meta is still very weak against this deck, most opponents will struggle to manage their resources well enough to finish the game, and some decks simply cant do it no matter how hard they try. However, some decks have a great matchup against this deck, and some decks can play techs to improve their chances. Let us go over some things that can give Zoroark control some trouble. Buzzwole – Extremely aggressive and hard to contain. Additionally, the Zoroark lists in Brazil were not prepared as they could have been for this deck. Players that don’t adapt will struggle. Rayquaza-GX/Vikavolt – Probably the worst matchup available for the Zoroark deck. Energy acceleration out of deck is very hard to deal with. They will eventually get to the point where they one shot you. You can’t trap anything active without Alolan Muk in play, due to the addition of Zeroara-GX. Metagross-GX – This is a tough one to navigate, but definitely not the end of the world. They are unable to OHKO you, and you have ways to try to stop them from attacking. This is an example of a matchup you can prepare for. Magnezone – This is a tricky one, and one that an inexperienced control player might not approach correctly. You need to understand that the opponent will get very low on prize cards, but that you always have a chance to stop them from drawing the last one. Sableye will be the key here, and simply discarding energy as much as possible throughout the game as you can is important. Those are the decks that can give us trouble. Now lets take a look at some pesky techs. As you can see, the deck is certainly not invincible. However, most of the decks that give this one trouble are weak against the rest of the meta. Additionally, the tech options certainly aren’t full proof, and definitely require skill to navigate to wins. So, why talk about these things? This is to convey the importance of adapting the list and keeping yourself well teched for the meta. Having a weak list for the field is a fantastic way to ensure a terrible day, so lets talk about a few inclusions that could be solid moving forward. The deck truly has infinite options when it comes to the list, but these are some cards that can address potential upcoming problems. 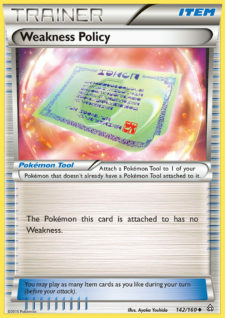 This card improves your Buzzwole matchup quite a bit, and you just need one of them! Putting a Weakness Policy on an Oranguru makes it very difficult for the opponent to KO. Playing multiple of these turns Buzzwole into a very easy matchup. I know, pretty crazy. 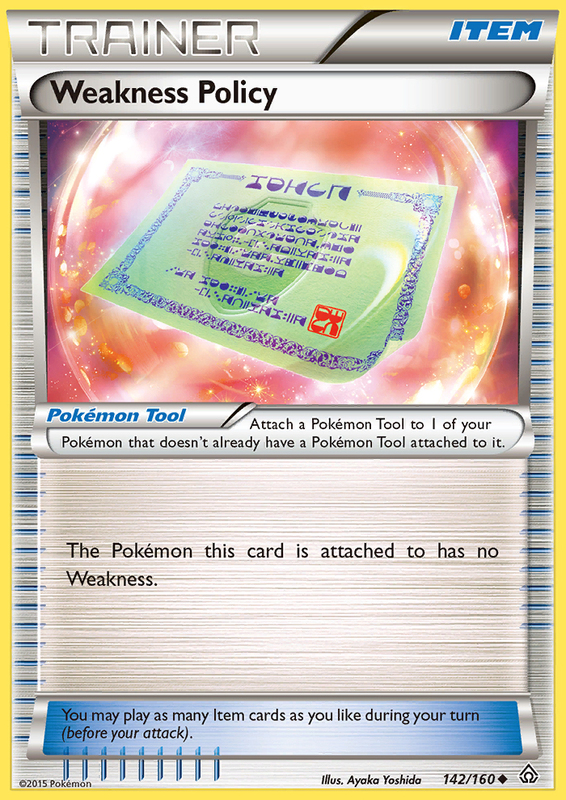 This card is used to beat decks that attempt to beat you through Faba and Lusamine, an otherwise tough strategy to beat. Against Lusamine decks, the game will be very slow, with neither of you doing much of anything. You will eventually get to thirty five cards in hand and just win the game. This is a card that I am honestly not a fan of, but it might be a necessary inclusion moving forward. It has a few situational uses, mostly against control decks. Girafrig can be used in Zoroark control mirror as a way of further controling the opponent’s resources. They won’t be able to shuffle these cards back in with Resource Management, so you can completely remove cards from the game. Girafrig can be used against Malamar as a way of denying Marshadow-GX usability. And finally, Girafrig is another approach to countering Lusamine decks. You can use the Giragfrig to remove Faba and Lusamines from play, and hopefully outlast the opponent. An issue with this strategy is that it takes a very long time, and you might not be able to scrounge up the win in fifty minutes. These are definitely awkward to play in the deck, but they could become a necessity in order to handle Faba. It is definitely the hardest counter to Faba, but is it the best one? The issue with this is that you make your deck more inconsistent and harder to operate, just so you can destroy Faba decks. Honestly, if it gets to the point where basic energies become a necessity in the deck, it will likely be time for me to hang the deck up. I don’t think we are at that point yet, though! That is all for today everyone! I am grateful to be able to dedicate an entire article to one of my favorite decks in recent history. The fact that it operates so differently from other decks, and gives me a great opportunity to outmaneuver my opponent is just so attractive to me. At the same time, I understand that the deck can be prepared for, and eventually forced out of the meta if players consistently tech hard for it. With that being said, it is still definitely one of my top options for the Roanoke Regional Championships. On top of the deck being incredibly strong and one of my favorites, I just don’t have a lot of time to prepare for the event. I got home from Brazil late Monday night, and I am currently writing this article from my location for this year’s Thanksgiving celebration. I still plan to try my absolute best, as this event is a great opportunity to get a start towards earning a Travel Award for the European International Championships. This is my biggest goal for each quarter, and I achieved my goal in the first quarter by finishing fourth in North America. Anyways, if you’ll be in Virginia, feel free to come up and say hi! Otherwise, enjoy your relaxing Thanksgiving break!